Established in 2010, El Segundo Brewing Company (ESBC) describes them selves as “THE hop-centric brewery for South Bay, Los Angeles and beyond.” There is no question that they have a love for hops at ESBC and they use them liberally, but without the bitterness one might find elsewhere. 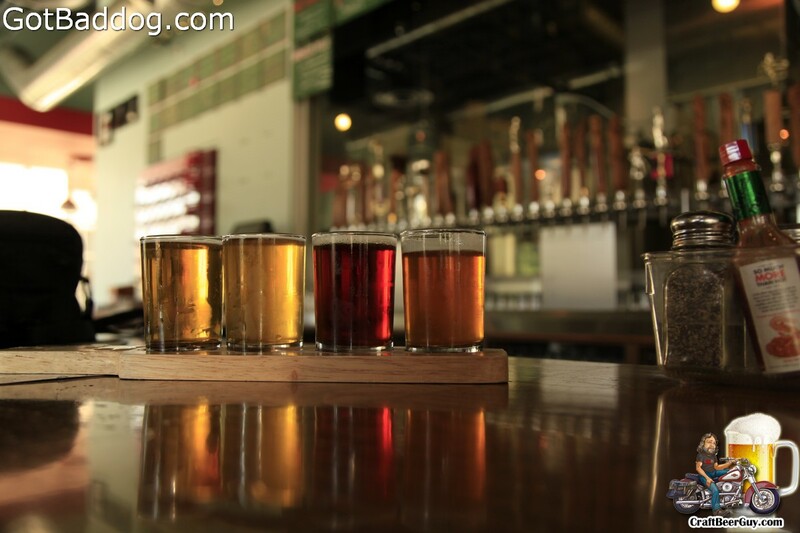 I am a hop head and for that I make no apologies and whenever I go into the El Segundo Brewing tasting room I am usually at a loss on what I should order. Their White Dog IPA, named after owner/brewer Rob Croxall’s dog, is off the hook with the use of 50% wheat instead of barley. Of course, if the Blue House IPA is available the decision on what to order is made easier by drinking a pint of one at the tasting room and getting a growler of the other to take home and enjoy. However, if the Two 5 Left DIPA is on tap, then I am in a real conundrum. First world problems I guess. Luckily, El Segundo Brewing Company is now bottling on a limited basis, so bringing bottles home (when available) is the solution. If you are not into IPA’s, they also make some very nice stouts and pale ales. Yesterday morning I was perusing my Facebook feed and saw a notice that Three Floyds Brewing would be suspending brewery tours until further notice. Now normally this would not even cause me to raise an eyebrow, but as my girlfriend is going there next week I thought I should look a little deeper. I followed the link and found a lot of input from a lot of people, a lot of it inane, but someone made the suggestion that that brewery tours were being suspended due to upgrades being made at Three Floyds because of a new Indiana law that had just been signed which would allow for increased production of beer by Indiana microbreweries. The law, House Bill 1293 (http://www.in.gov/legislative/bills/2013/HB/HB1293.1.html), states in relevant part: “Creates an artisan distiller’s permit for a person who desires to commercially manufacture not more than 10,000 gallons of liquor in a calendar year (excluding the amount of any liquor sold through a liquor wholesaler).” This will become effective July 1, 2013. So, what might this mean for us? From what I am reading, while microbreweries might be limited to producing 10,000 gallons to be sold in their brewpubs and tasting rooms, if they get a distributor their only limitation is how much they can brew. Who knows, maybe one day we will be able to find Zombie Dust at the local Total Wine. That would be the nicest thing Indiana has done in a while. I have always felt pretty fortunate to live in the South Bay with its great weather and lack of natural disasters, but the recent explosion of craft brewers in the area has made living here that much better. Earlier in the month, Torrance Mayor Scotto even cited craft beer as a new growth industry for Torrance. I will do all I can to help Torrance craft brewers succeed and look forward to the day that a tour of Torrance microbreweries will rival anything San Diego County can offer. Torrance currently has three microbreweries with tasting rooms, Strand Brewing Company, Monkish Brewing Company and Smog City Brewing. On Saturday my girlfriend Tanya and I had gone out to photograph flowers at the South Coast Botanical Gardens, which just happened to be around the corner from Strand Brewing Company, so we made a stop on the way home. 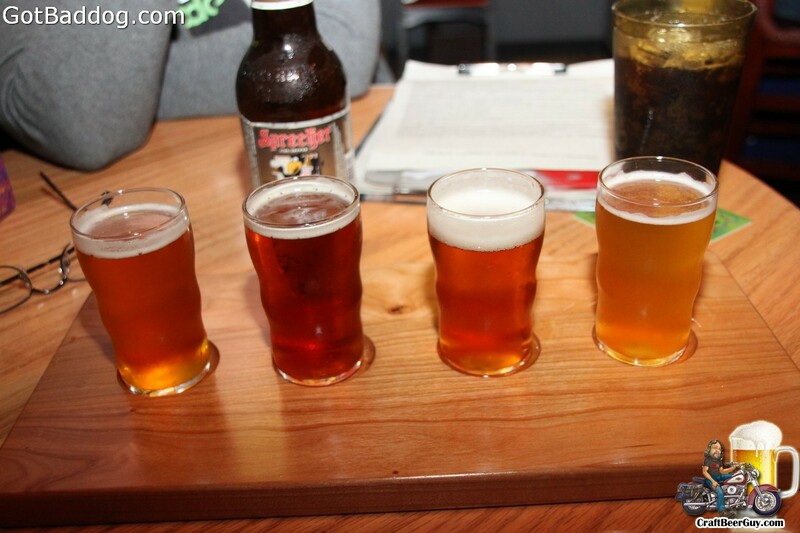 Strand Brewing Company is one of the original two microbreweries here that has a tasting room. While the tasting room has only been open for little over a year, Strand Brewing has been in business since 2009, supplying local establishments that serve craft beer. Probably best known for their 24th Street Pale Ale and Atticus IPA’s, Strand Brewing’s owner/brewmaster Joel Elliot has been releasing a few different styles including some outstanding Double IPA’s, with White Sand being a personal favorite. Their Second Sleep Imperial Stout is another standout. Strand has recently started bottling beers so it is becoming easier to take my favorites home and have them last longer than what growler can provide. Tanya was getting a little hungry, so we decided to head over to Monkish Brewing Company because they seem to always have a food truck there on Fridays and Saturdays. Saturday they had Andy’s Cart, a gourmet hot dog and sausage cart. We tried their Chicago dog and a Reuben sausage sandwich; they were pretty good. 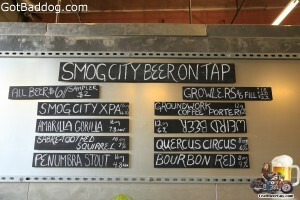 Saturday was day six of the 8th Annual American Craft Beer Week (ACBW) and to be honest, it was a day that I had been waiting for like a kid at Christmas; Smog City Brewing Company finally had their grand opening. 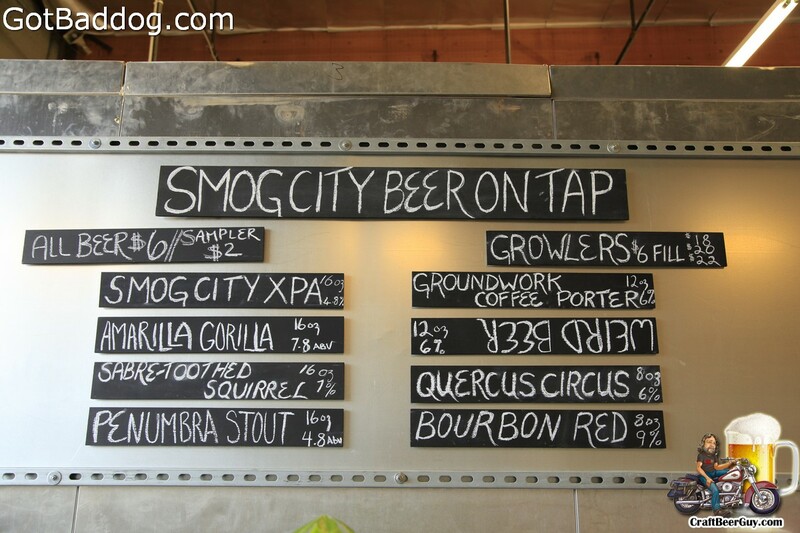 It is not like the South Bay is lacking in microbreweries, but Smog City is geographically the closest to me (by about two blocks) and Jon Porter(owner/brewer, goes by Porter) brews the widest variety of beers for miles. On their tap list Saturday, they had Smog City XPA, Groundwork Coffee Porter, Sabre-Toothed Squirrel(Red Ale), Quercus Circus (Sour), Bourbon Red (Barrel Aged), Penumbra Stout, Amarilla Gorilla (IPA) and Weird Beer (Saison). The plan is to eventually have 20 beers available on their taps, so in my opinion, Smog City Brewing is a great addition to the South Bay craft beer scene. Oh, and Porter won a gold at the 2012 Great American Beer Festival for his Groundwork Coffee Porter. After leaving Smog City I headed over to a birthday party for the president of one of the local home brewing clubs, Strand Brewers Club. I felt it appropriate that I include was able to include a home brewers gathering in this celebration of American craft beer. It seems that every biography I read about a respected brewer includes science and/or engineering and being a home brewer. In fact, Porter of Smog City started off as a home brewer and was a member of the Pacific Gravity home brewers club and won many competitions as a home brewer. The host of the Strand Brewers Club party was Rives Borland, the current president, because it was his birthday. A look around Rives living room shows he has several ribbons and plaques from brewing competitions under his belt, so you never know; someday I may be writing about his new brewery, only time will tell. 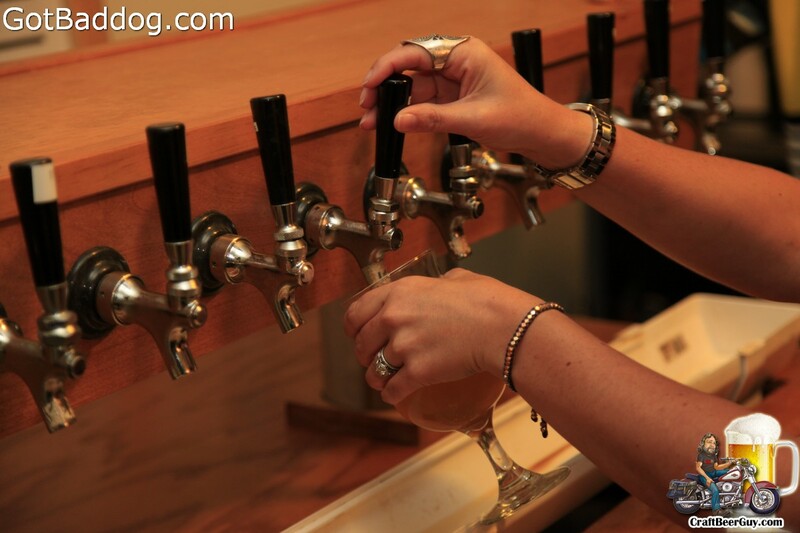 You can see all the photos from day 6 of the 2013 American Craft Beer Week on GotBaddog.com. Friday was day 5 of the 8th Annual American Craft Beer Week (ACBW) and I am fortunate enough to have two award winning brewers within a few miles of my home. The first being San Pedro Brewing Company and the other being Smog City Brewing. As legend has it, in the beginning there were three microbreweries in the South Bay; Manhattan Beach Brewing Company, Redondo Beach Brewing Company and San Pedro Brewing Company. 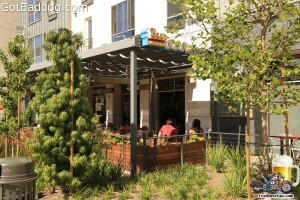 Manhattan Beach Brewing gave up on brewing and became a gastropub (Brewco Manhattan Beach), preferring to sell a wide variety of craft beers brewed by others. 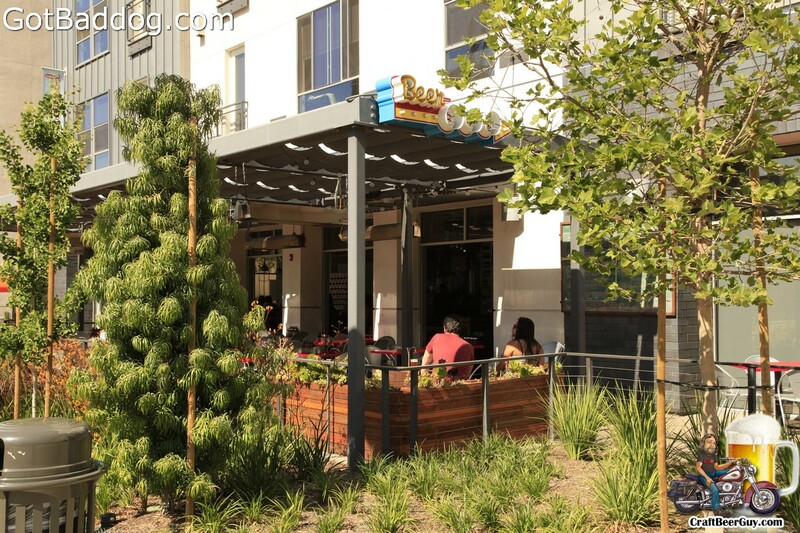 Redondo Beach Brewing Company continues to brew at their Riviera Village brewpub, but they do not experiment much and the beer recipes seemed to stay the same, batch after batch; it is a good entry level brewery to visit, but nothing exciting. 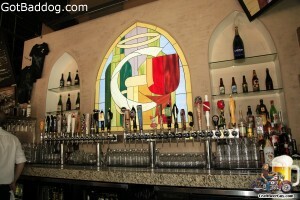 Rumor has it that they will be discontinuing brewing there soon, preferring to go the route of Manhattan Beach Brewing. Of the three, San Pedro Brewing Company continues to brew and is opening a subsidiary of sorts, Port Town Brewing which has already won numerous awards. 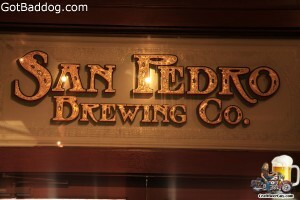 San Pedro Brewing Company (SPBC) is a brewpub that has been at their current location for 13 years. They have won more than 43 medals in local county fairs, commercial beer competitions and international beer festivals. In addition to award winning beers, they have some pretty good food. SPBC gives tours on Friday afternoons, so if in the area, you might want to check it out. I was given a mini-tour and have to admit, I was quite surprised at the quantity and quality of beers they brew with such a small operation. When I was taken downstairs I fully expected to see a massive operation; as you can tell by the photos that was far from being the case. While there I tried a flight of all seven in-house brewed beers that were available: Bruin Blonde Ale (2012 Silver Medal, California Commercial Beer Competition), Longshoreman Lager (2009 Gold Medal American Style Lager, Los Angeles County Fair), Port Town Hefeweizen, Mai Bock Spring Lager, Iowa Battleship IPA, Beacon Street Barleywine (2012 American Style Barleywine, Los Angeles International Beer Competition) and Sunken City Imperial Stout. When I left San Pedro I headed over to Smog City Brewing as they just got their growlers in and I wanted to be among the first on my block to own one. 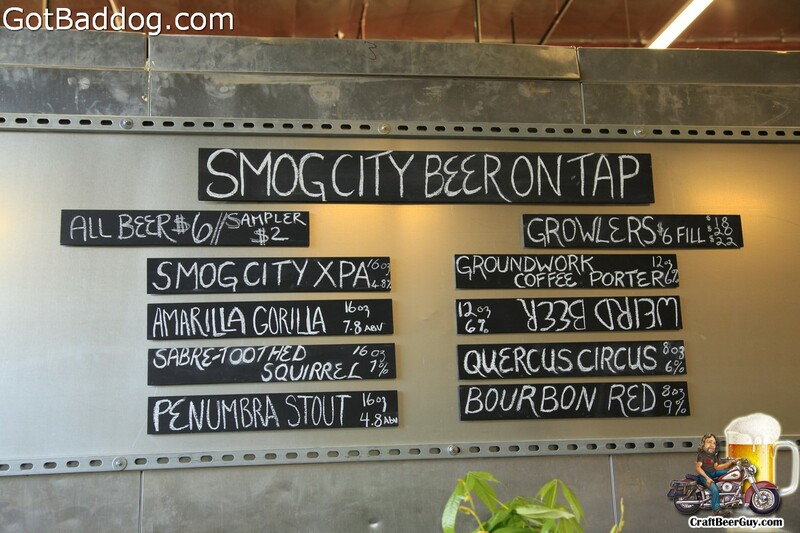 While there I had a Quercus Circus Sour and an Amarilla Gorilla IPA; we picked up a growler of the 2012 Great American Beer Festival gold medal winner, Smog City Groundwork Coffee Porter. 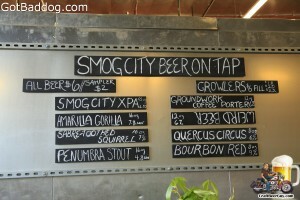 Smog City’s grand opening was held on Saturday, so that will be the subject of my ACBW day 6 report. All my photos from day five of American Craft beer Week will be found on GotBaddog.com. Tuesday was day two of the 8th Annual American Craft Beer Week (ACBW), and I continued my attempt to visit as many Great American Beer Fest (GABF) gold medal winning craft brewers from the Southern California area as possible. If I am able to cross paths with winners from other states in the process, that is fine with me. If you read my story about day one of ACBW, you will recall that I had attempted to visit Beachwood BBQ & Brewing but discovered that there were closed on Mondays. Since I had a pretty busy morning, it was decided that I would go back there on Tuesday because not only have they won multiple awards, it was a safe bet that their guest tap list would have at least one medal winner among the selections. I would not be disappointed. As you can figure out, I am not a stranger to Beachwood BBQ & Brewing; the only thing that keeps me from going there more often is the drive. 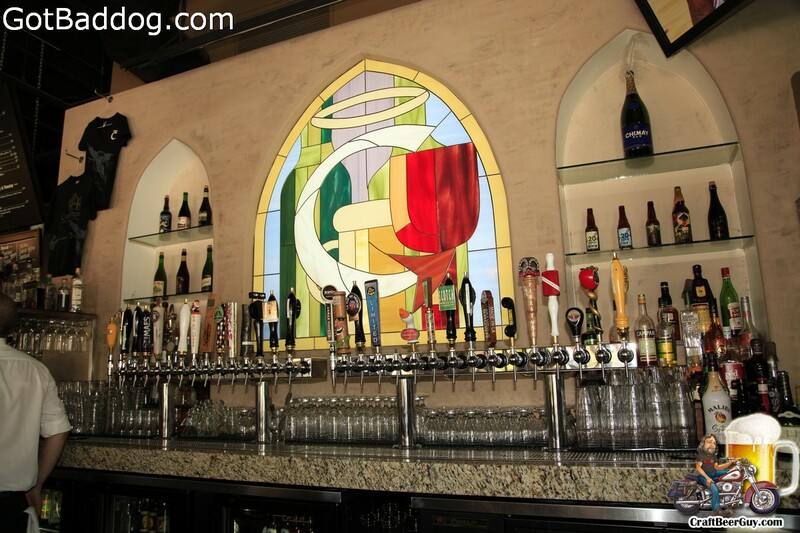 I mentioned in my last article that I got the impression that the beertender at Pizza Port San Clemente was not really into craft beer, that it was just a job for him. I have never experienced that any time I have visited Beachwood; in fact, it has always been quite the opposite. Yesterday Thomas was working and you could tell that he enjoyed his work and was a fan of not only Beachwood Brewing’s beers, but craft beer in general. Welcome to Craft Beer Guy, it is not coincidental that this site is going live when it is as this is day one of the 8th Annual American Craft Beer Week. While I have been a craft beer fan for many years, I live in the Los Angeles area and to be blunt, we were sorely lacking on the craft beer scene. It seemed that Samuel Adams, Sierra Nevada Pale Ale and Fat Tire were about as much as we could hope for around here. Luckily, things have really changed around here which I discovered last year when covering the event. The craft beer scene in Southern California used to be limited to the San Diego area, but now things are catching up around here; and in my own back yard. This year I decided to try to do something a little different; I am going to attempt to visit as many Great American Beer Festival (GABF) gold medal winners as possible in the area. In the event that I end up at a gastropub, I will attempt to purchase a gold medal winner. Should be easy, right? Because I am somewhat limited by the hours in a day, I will be forced to limit my radius to about 60 miles. Most of the eligible breweries are inland of me, and it was close to 90 at home so I did not want to venture inland and opted for heading to Pizza Port in San Clemente, CA since it is a beach community. 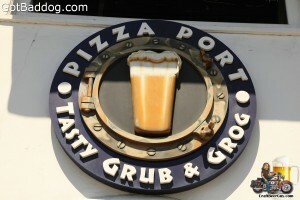 Pizza Port is a chain of pizza places that also brew beer. Unlike some chains, each location has their own head brewer and they are given leeway on at least some of the beers they brew. If you glance at the list of GABF winners you will notice that Pizza Port San Clemente, Solano Beach and Carlsbad have all been winners. 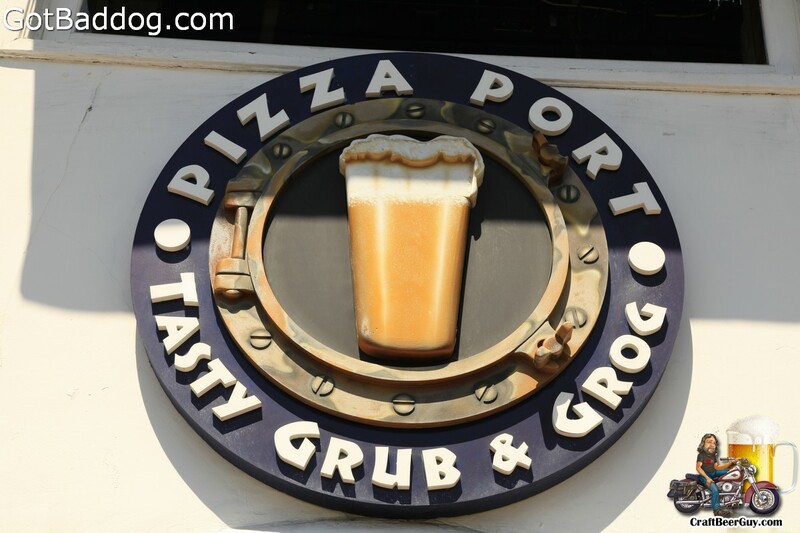 I have never been to Pizza Port and I don’t recall ever trying anything from any of their locations prior to today; however, I have heard lots of praise about them so I was looking forward to the experience. My hopes of a cool ride by the beach turned into a blast furnace ride with temperatures close to 100. Even in San Clemente it was 90 a couple blocks from the beach. I was really looking forward to the beers. When we arrived, my girlfriend went up to the counter to order food. We got some “beer buddies” and a small pizza. While the attitude of the employees in that portion of the brewpub was helpful and upbeat, neither of us was particularly enthusiastic about the food. The beer buddies would have been better if there was some kind of garlic dipping sauce, but it wasn’t offered and I was there for the beer anyway. I explained that it was, and that I was seeking gold medal winning beer and Pizza Port had won a few. He agreed that they had. I asked if they served flights. He said they did flights of four, so I asked for four gold medal winners. He told me there were only two available; so I asked for those and any other award winners they had. He then directed me to a very busy board and told me the award winners had emblems by their names. It took me a few minutes to figure out where the emblems were. Eventually I figured out what the third beer was and since I was not going to wait for any assistance from him, I just picked a fourth beer to complete the flight. My flight consisted of their Lightweight Lager (it was), Nerf Herder (San Diego World Beer Cup Bronze Winner), “Pseudo” IPA (2010 GABF Gold Winner) and Pier Rat Porter (San Diego World Beer Cup Gold Winner). The beers were okay, the experience was lacking. On the way home I figured that we could stop by Beachwood BBQ & Brewing in Long Beach as they are gold medal winners and always have a great selection of beers available. To my dismay, they are not open on Mondays; luckily, Congregation Ale House, Long Beach is right next door. While they do not brew beer, they do have a very nice selection of beers on tap. I opted to go for a Firestone Walker Brewing Co. Wookey Jack (2102 GABF Gold Winner). Firestone makes a good product, so I was happy. The beer drinking ended at home with a Black Sand Imperial IPA from Strand Brewing Company in Torrance. All my photos from day one of the 8th Annual American Craft Beer Week can be found on GotBaddog.com.